Now is the perfect time to lease a 2017 Alfa Romeo Giulia in Cincinnati! You will not only get the car of your dreams, but you’ll get it at an amazing price! For a 2017 Alfa Romeo Giulia AWD, you can lease it for $399 per month* for 39 months with $2,500 due at signing plus tax, title and reg. fees. For a 2017 Alfa Romeo Giulia RWD, you can lease it for $369 per month** for 36 months with $3,999 due at signing. If the 2017 Giulia TI AWD is the vehicle you want, lease it for $409 per month *** for 36 months with $3,999 due at signing. Why get a 2017 Alfa Romeo Giulia in Cincinnati? If you want performance and luxury tied together, this is the vehicle for you. You’ll get the best in class performance with up to 505 horsepower and a class leading 3.8 0 to 60 speed and reaching a top speed of 191 mile per hour. Combined with a driver selected modes with the Alfa DNA Drive Selector, you can choose how the vehicle handles. This includes dynamic, natural, or advanced efficiency. If you need more stopping power to control all this power, you’ll have available carbon-ceramic Brembo brakes. For even more customization, the Alfa Romeo Giulia has accessories that can be added to make the vehicle yours. This includes gear knobs, door projection lights, aluminum sports pedal, front grille features with carbon fiber inserts, twin exhaust tailpipe, roof box, carbon fibre mirror covers, aluminum fuel cap, wheel bolt kits and more! Does the Alfa Romeo Giulia in Cincinnati lease specials sound like an amazing deal? 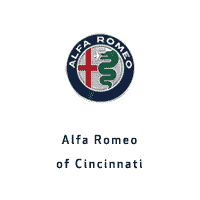 Come see us as at AlfaRomeo of Cincinnati and test drive one today! *Low-mileage lease for well-qualified lessees. Based on MSRP example of $45,140. STK# H7552060. Pricing includes conquest incentive of $2,750 MUST OWN NON FCA VEHICLE TO QUALIFY. Must be current owner of competitive brand vehicle (non-FCA US LLC). No turn-in or trade-in required. Total due at lease signing includes a down payment and first month’s payment. Offer requires dealer contribution. Tax, title and license extra. Lessee pays for excess wear and mileage of $0.20/mile for each mile over 10,000 miles per year, if vehicle is returned at end of term. Option to buy at lease end at pre-negotiated price. Dealer’s actual terms may vary. Offer through Ally. Residency restrictions apply. Must take retail delivery by January 31, 2018.